Good morning, Papertrey is Celebrating their 6 year anniversary!!! The challenge is to pick one of the designers inspirational pieces and design a card or project. I chose Melissa, her work is stunning!! One of my favorite things about Melissa is her felt flowers. Thanks Melissa for all you do! We have a new puppy in the family. He is a little over four months old, he is a Shiba Inu and his name is Hachi. He has been keeping me very busy. I hope everyone enjoys Papertrey Inc. 6 year Anniversary festivities!! Have a great day! Hachi is adorable , oh I bet you are having so much fun and hope he is not too much work. Did you see the movie Hachi? Look at those white paws, too cute ! 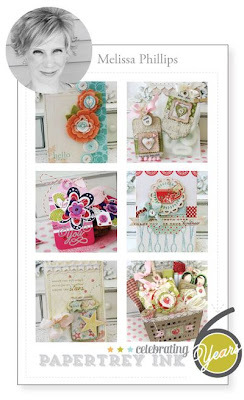 Love your card too.The felt flowers with the pretty pearl buttons too sweet! Love the font of the sentiment too! Enjoy your new family member Nancy! Welcome back! Good to see a pic of your newest family member! Love how your card turned out ... the neutrals plus the blue is such a fresh combo! Your puppy is adorable. I am sure he is keeping you on your toes. I hope you are getting some sleep!! Gorgeous card and puppy. We'll have to exchange a card this year - I'll try to pm you on the PTI forum.